The idea of using Open Source software is getting more and more realistic everyday; independent consultants have conducted extensive research and concluded that for quite a few IT solutions Open Source offers a worthwhile alternative. Customer and Vendor perspectives toward OSS are different, and the following table represent them in short, below an analysis of them and some thoughts about how to make business out of it. Savings on licensing Now. And than? Customers expect to save money, but they’re wondering about what’s next. Despite cost of exit might be lower with OSS, since rarely data are stored in proprietary formats within open source solution, it’s true that CIOs always wonder about the future. Avoiding lock-in is told to be another important issue, but choosing the “right” platform, that means solutions broadly supported and generally recognized as mature (see GRAM, OSMM and BRR), it’s a must. Large to medium companies want to cope with large to medium vendors, but quite often OSS is deployed mostly by SMBs. Some companies can afford indemnification costs, and are willing to in order to reduce uncertainty. Last but not least some companies desire a form of warranties, and can afford to pay for this. About vendors perspectives as shown with the linux-embedded case, sharing standards or participating to sequential innovation is a nice to have, and it implies costs of membership, effort and so on. Reducing production costs is welcome, but it requires a symbiotic approach and, as commercial Linux distribution companies know, it’s not for free. Vendors like to work with strong brands, since makes easier to commercialize their solutions, but very few OSS have a (unique) corporate actor willing to spend money to make it known. About tracking software production only community driven by a corporate or a foundation can manage to do it, and making it compulsory, besides low bug density measured in famous OS, project traceability is a difficult task. Integration of OSS stack might be tricky, since a vendor has a limited number of workers and therefore of expertise, mediation to other OS project might be desirable. 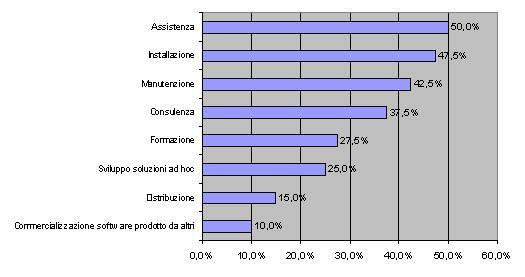 Coming to the Italian market, an essay produced by IDC this spring show how the majority of companies interviewed in a mixed champion made of 150 firms, the most wanted services are the basic ones (“assistenza” aka support , “installazione” aka installation and “manutenzione” aka maintenance). The worldwide situation is quite similar, as shown by other studies conducted by Forrester, where CIO of large companies answering the question “Where do you run Linux today” reported 44% within web/e-mail thier. 59% of them did it by themselves. Implementation is deployed by vendors for 39% of interviewed, where 66% did it with internal personnel. There is clearly space for ICT outsourcing in this area.